I've tried to stay out of this, at least publicly, but with Donald Trump now pretty much assured the Republican nomination, what would be the point of remaining politic (adjective: "seeming sensible and judicious under the circumstances") when the world is turning upside-down? The last head-to-head fantasy match-up poll I saw had Bernie Sanders beating Donald Trump. It had Hillary Clinton losing to Trump. That's upside-down. How could such an over-qualified and historic candidate lose to such an unqualified and dangerous "reality star"? And how could an old, grumpy socialist beat the billionaire braggart? Not that I'm swayed by polls or even pay them much attention at this point in the political cycle. But that poll is a bell wether. It signals this year's zeitgeist (noun: "the defining spirit or mood of a particular period of history as shown by the ideas and beliefs of the time"). The voters are hating on "establishment types" (noun: "losers") and will no longer countenance them. Hence, Donald Trump and Bernie Sanders. Trump is a bully with a bully's instincts. Sanders has the contrasting instincts that I want infusing my nation, let alone my nation's government. Hillary Clinton is "establishment," and in my judgment, she cannot win against Trump. Hillary Clinton is bespoke. She's been Wall Street's creature for years, and she was tailored by the establishment for the establishment. That's a fashion I cannot follow in this year of the anti-establishment hostile takeover of politics. Jerry, I agree with you. 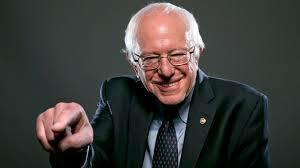 Practically speaking, given the mass support for Bernie, which of course must continue to build, he has a good chance in the fall--provided he can identify for the voters what he and Trump share and what they profoundly differ on. Up to now the media has let the Trump campaign get away with NO formal policy statements on ANYTHING, focusing all their attention on the entertainment factor of The Donald. This must cease--the vague resentments of the voters must be given focus, and Bernie's positions can clearly be shown to make sense while Trump's blatherings will be seen to remain just that. Hillary was on the board of WalMart for years, which she doesn't exactly advertise, and she has too close ties to the evil Tyson Foods, just like old Bill did. She claims to be a "progressive" by citing her tenure as a legal services attorney, but as far as I can tell, she was just a board member. Big deal. Big sacrifice. Bill Clinton with his Democratic Leadership Council was a moderate Republican at best. She's the same. I'll never forget Clinton during his first campaign flying back to Little Rock to oversee the execution of a mentally retarded convict. What humanity. I'm with Bernie. A true Democrat (even though he says he isn't one). HOWEVER, vote for EITHER of them in the Fall against Trump. And yes, I'm voting Bernie in March....but the Trump must NOT take over th Washington...God help us all! Well, the intellectual Trumpsters have arrived. It is really humorous when local crazies who are trying to decide between a socialist and aserial liar who is being investigated by the FBI can take time away from their deliberations to denigrate the supporters of other candidates. If "oh Susannah" hadn't already disqualified herself via a history of silly posts, her opinion might matter. I'll put my "history of silly posts" up against your history of posts but ... oh yeah, you're "Anonymous." You conservatives will have to learn the hard way that Trump is no conservative. He's an opportunist with an authoritarian streak who plans to hire "smart people" to tell him what to do in the White House. Kool Aide, meet voters!